Daucus carota .es.wikipedia.org. (Accessed 5/2014). 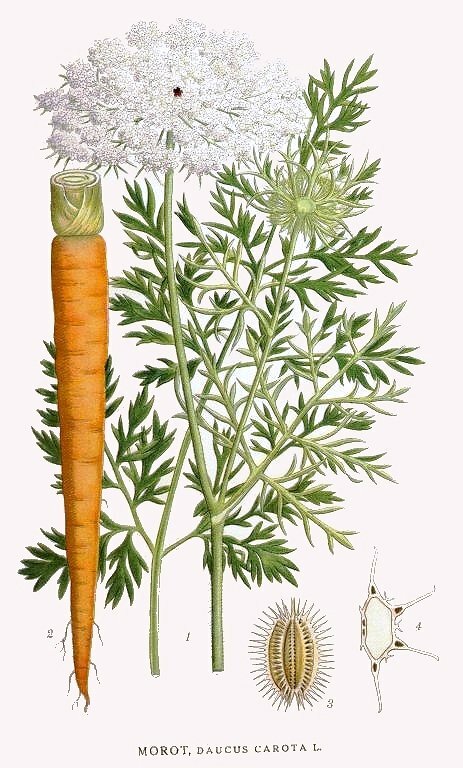 Daucus carota is a biennial, sometimes annual to short-lived perennial herb, from a large taproot, (same species as cultivated carrot), flowering stems to 1 m second year, grooved, hairy; crushed plant with carrot odor. Leaves alternate, pinnate, finely divided, ultimate segments linear to oblong. 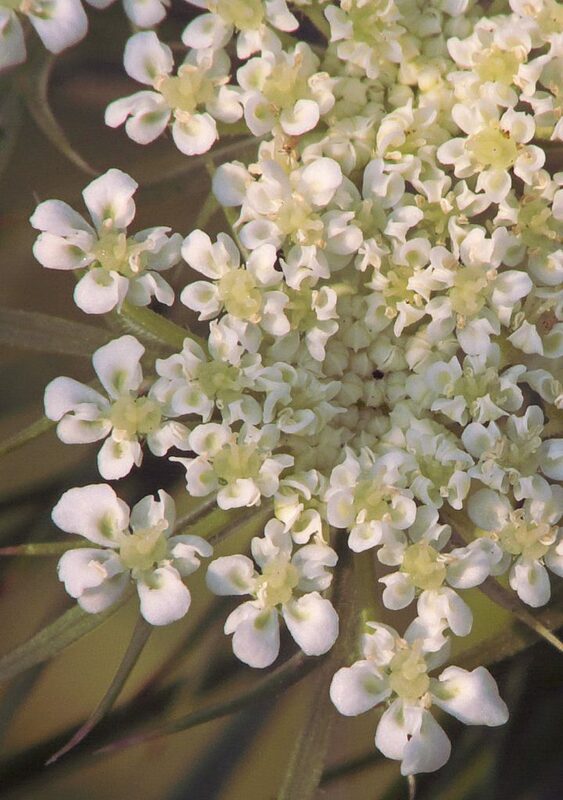 Daucus carota flowers. commons.wikimedia.org (Accessed 2/2018). Flowers white, radially symmetrical, 5-parted, small; inflorescence umbrella-shaped, compound, 4-12 cm wide, outer rays longer than inner creating a flat or domed floral display, central flower of inflorescence purple; blooms June-Sept. Pollinated by numerous insects including bumblebees, flies and beetles, also visited by several wasps, usually cross-pollinated, also self fertile. Flowers are protandrous (male function develops before female) leading to cross pollination (Mulligan and Kevan 1973; Westmoreland and Muntan 1996)., one plant may produce 40,000 seeds. Seeds can remain viable in the soil for several years and germinate in response to disturbance (Dale 1974). Fruit dry, about 0.3 cm, spiny; mature inflorescence branches contracted upward and inward, partially enclosing fruiting heads (bird’s nest phase), (Levine 1995), as fruits dry, the rays open outward again and the seeds are dispersed as dry inflorescence breaks up through fall and winter. Seeds survive only 1-2 years in soil; eaten by some small mammals (Martin et al. 1951),. 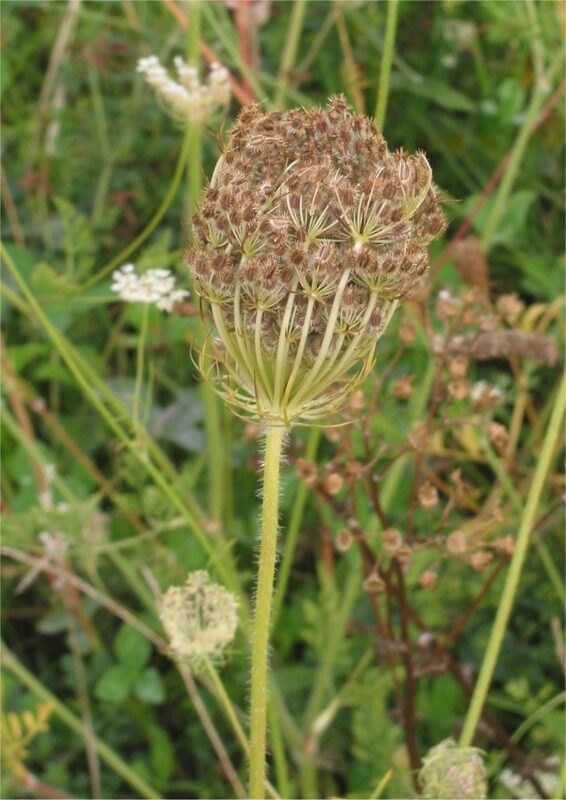 Daucus carota Queen-annes-lace) habitat. © 2011 k. chayka. Minnesota Wildflowers. minnesotawildflowers.info (Accessed 2/2018). 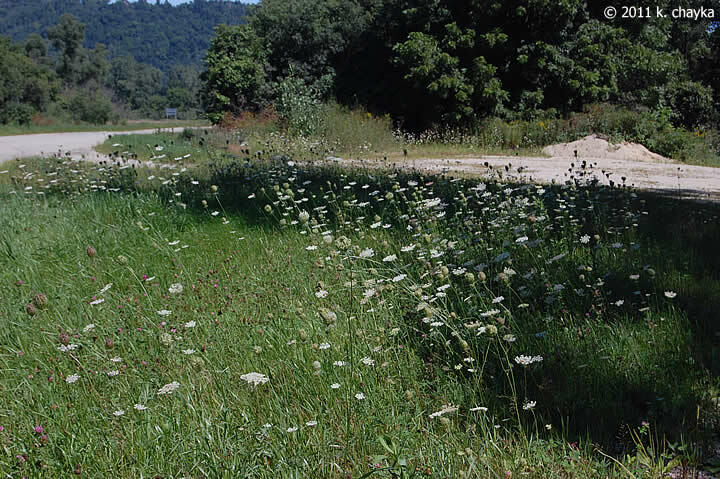 Habitat: Open, upland areas, roadsides, meadows. Needs open soil to germinate and develop (Goldberg, 1987). In NYC found in soil with pH 7.8 (Gargiullo unpublished data). 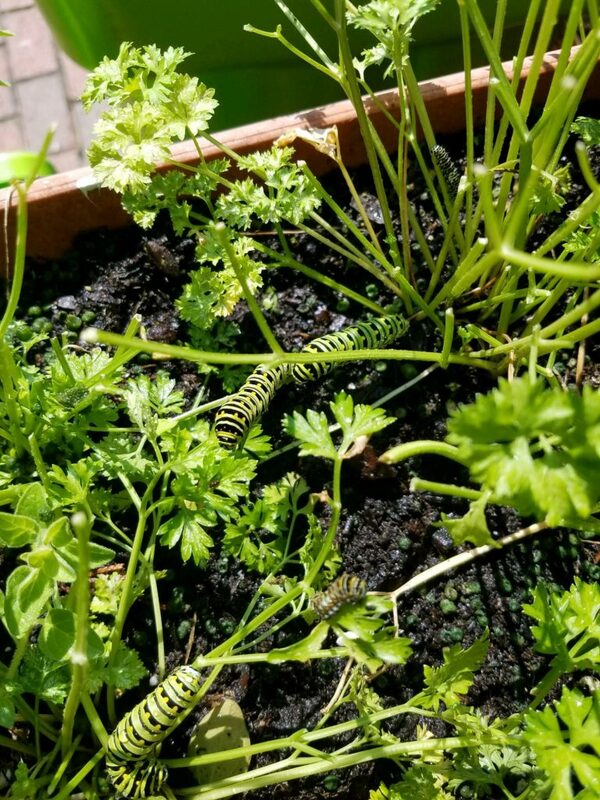 Notes: Wild carrot and other Apiaceae of open sites are eaten by larvae of the black swallowtail butterfly, Papilio polyxenes (Papilionidae) (Tallamy 2003; Pyle 1981). Seeds are attacked by nymphs of plant bug genus, Lygus sp. ; roots eaten by carrot rust fly, Psila rosae, and two genera of nematodes, Protylenchus spp., and Meloidogyne spp. ; plants damaged by a mycoplasm transmitted by leaf hoppers (Eckardt, 1995b).). 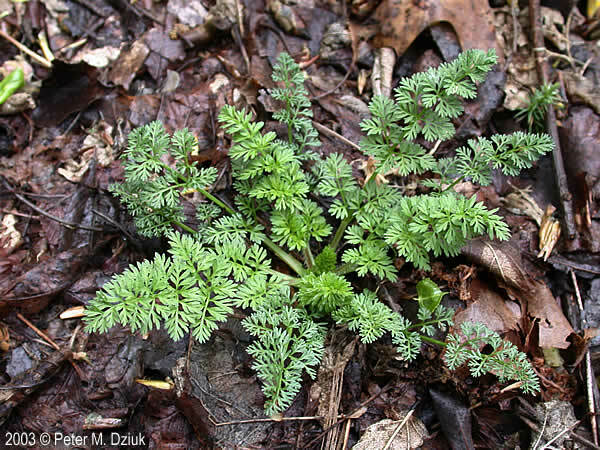 Wild carrot is also infected by the leaf blights Cercospora carotae and Alternaria dauci (Dale 1974).